Rent Reflections at the Buttes | Corporate Events | Wedding Locations, Event Spaces and Party Venues. When you have Reflections handle the details of your wedding or special event, you'll have the most experienced team of event planners in the business making sure that you can concentrate on enjoying your day. re you planning a wedding in Tucson? We specialize in wedding ceremonies and receptions with several options for reception halls and a broad range of services to help you plan the perfect celebration of your life and the start of your new life together. Our expert event planners will work with you to plan your wedding or special event down to the last detail. Reflections offers three wedding venues to provide the perfect location for your wedding ceremony and wedding reception. The Buttes and the Gallery offer breathtaking settings for outdoor weddings with beautifully manicured grounds, gardens, and romantic settings to help you find the perfect wedding venue for your celebration. of culinary selections to choose from for your Reflections wedding. We provide candlelit dining and custom décor for wedding receptions, including linens, centerpieces, chivari chairs, charger pates, and more. In addition, we offer several options for affordable bartending packages, disc jockey services, and experienced event planners to help you select the perfect wedding hall and create the wedding of your dreams. 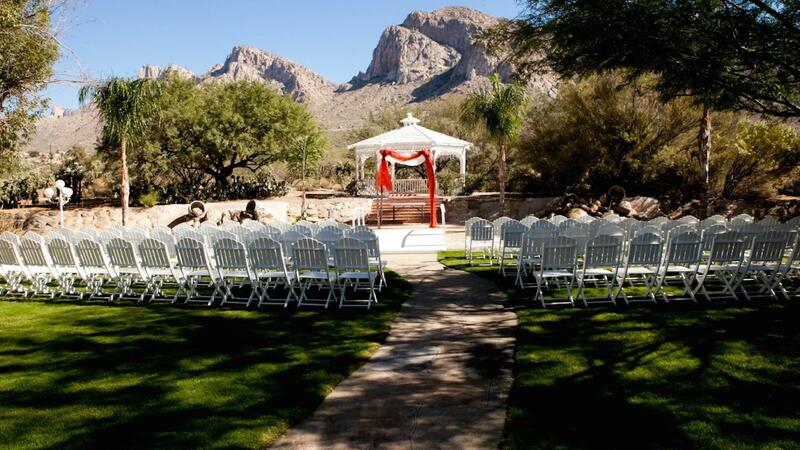 We welcome the opportunity to speak with you about your wedding or special event in Tucson. Please browse our website to learn more about our locations for outdoor weddings, wedding halls, catering and event planning services. Besides the planning of the event itself, you can take advantage of these other services that might not always be standard with other companies.